If you are familiar with Dr. Masaru Emoto’s books such as the Hidden Messages in Water etc, you may want to take some time out tomorrow (March 31) to collectively say a prayer for Japan. News states that nuclear energy has already seeped into the sea water. This is the water of the world, ALL of us will be affected one way or the other. Maybe not today, maybe not tomorrow but it will happen unless we do something to help change it. Reports say that we do not necessarily get our seafood or nutrients from that side of the “sea” how is that possible? Water keeps flowing all around the world, the poison that nuclear energy inflicts can last generations and we do not know how it will or can morph into something else over time. To shrug this notion off is a crime, we are all connected and we have to do our part for ourselves, for our family, our children and other generations to come. I do hope you can all join me in this prayer. “The water of Fukushima Nuclear Plant, we are sorry to make you suffer. Please forgive us. We thank you, and we love you.” Please say it aloud or in your mind. Repeat it three times as you put your hands together in a prayer position. Please offer your sincere prayer. Thank you very much from my heart. 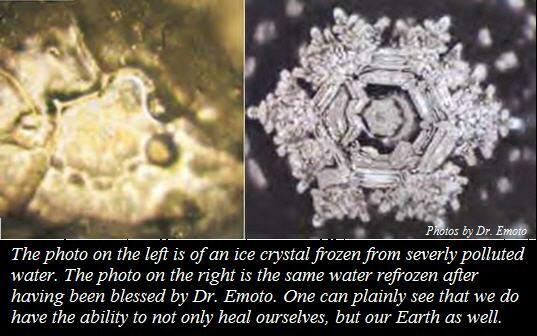 Thank you, Dr. Emoto for the calling of higher consciousness through prayer to reestablish the order of harmony, health and well-being of all life. Until man embraces the interconnectedness of all consciousness,immense gratitude to the internet for helping bridge that fact.